Brna (otok Korčula) is the right destination for your vacation? Matko is the name of this object, located in Brna (otok Korčula). This object is 10 m of air distance away from the sea. During the summer days, look for refreshments for yourself and your family on the beach that is 50 m away from the object. The beach is: pebble and concrete slabs. To stay on the beach, make sure that you bring towels and protect yourself from the sun with a hat or sunshade, and use a protective cream. Matko has a secured parking, which is another advantage of this accommodation, and is of crucial importance if you travel by car on your vacation. During your vacation, most people love to prepare fish or meat on the grill for dinner or lunch. And after dinner enjoy the night in a pleasant company. The object "Matko" has Grill, so if you like barbecues then you will definitely enjoy staying in this object. Any additional questions related to the beach or destination Brna (otok Korčula) please check with your host because they still know best the location. We wish you a warm welcome to our facility Matko in destination Brna (otok Korčula). 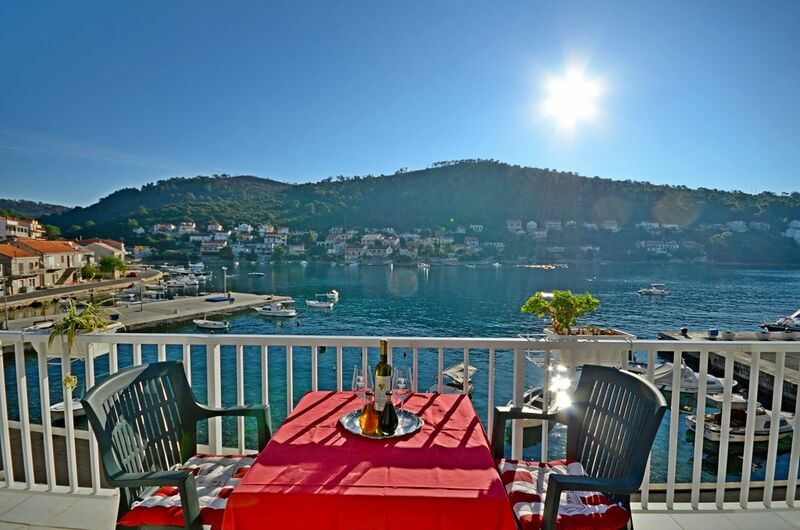 Accommodation Matko is located 10 m from the sea, 0 m from the center in the town Brna (otok Korčula). This accommodation offers a view of the Sea. Type of beach pebble and concrete slabs. Private accommodation Matko is ideal for 7 persons and has 3 rooms in the accommodation. Accommodation is equipped with: Air conditioning, Television, Internet, Baby crib, Iron. To make the hot summer days more bearable in the accommodation there is an Air conditioning. Apartment Matko - friendly and welcoming. The owner/staff were awaiting our arrival even though we were very late in coming. The apartment is spacious and well appointed. The staff was very accommodating and friendly. Three friends stayed in this great apartment above the coffee shop in Brna. The owner was very kind and helpful and the space was great. Wonderful view from the balcony. prijazni gostitelji,lepo mesto, apartma je dosta veliki,lokacija je super - klima ne radi,drugo je vse o.k. Skvele misto pro rodinnnou dovolenou nebo pro skupinu pratel. Vse bulo skvele a vrele doporucuji. Vacances très réussies, Brna situé au centre de l''île, au calme et encore authentique! l''annonce aurait toutefois pu préciser que l''appartement se trouve au 2e étage au dessus d''un bar... Quelques nuisances sonores parfois le soir.